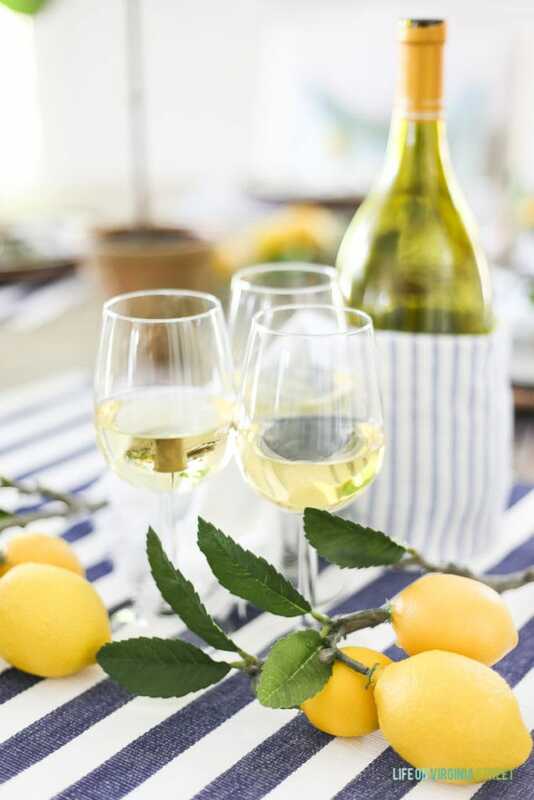 Today I’ve teamed up again with the Styled + Set crew to bring you some summer entertaining ideas! I love this group of bloggers, hosted by Lory from Designthusiasm, because each and every one is super talented and they always leave me feeling inspired! If you’re stopping in from French Country Cottage, welcome! 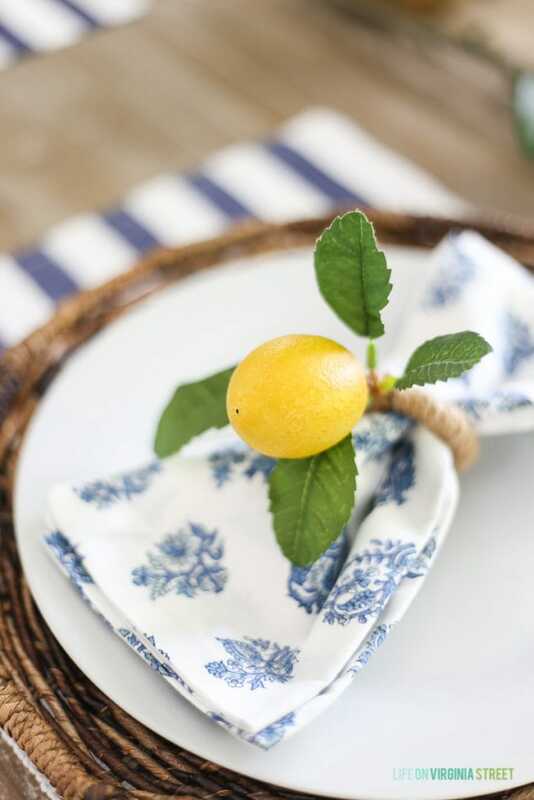 My summer tablescape is full of lemons and stripes and a little bit of wine 😉 Inspired by our recent trip to Italy, and more specifically Capri and the Amalfi Coast, I combined my love of lemons and navy stripes into this tablescape! 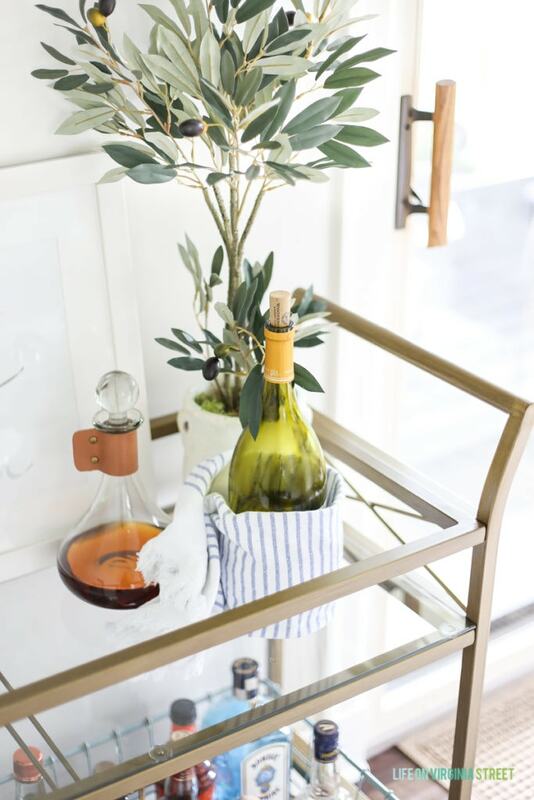 I’ve listed some sources along the way, but also have a full listing of sources at the end of the post for both the tablescape and bar cart. Welcome to our summer dining room! 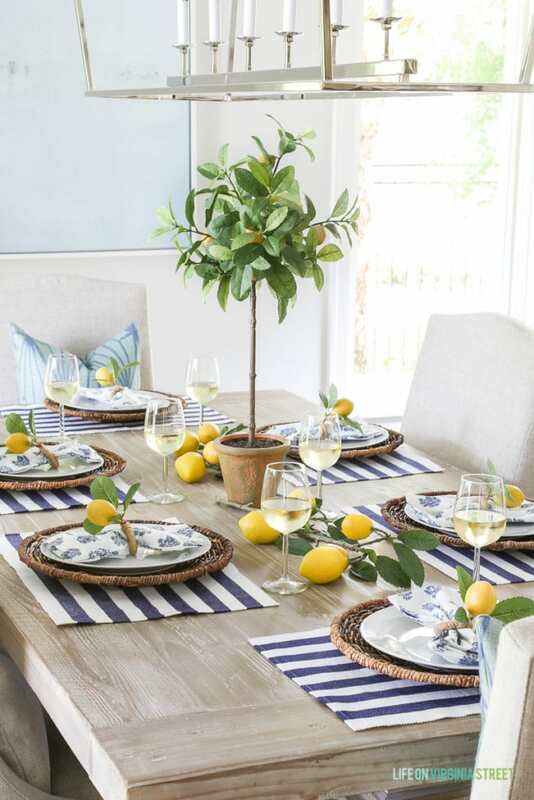 The lemon stems I used down the center of the table were from Pottery Barn, but sadly it looks like they’re already sold out. I picked up this cute faux olive tree recently at HomeGoods and thought it went perfectly with the Italian theme. The decanter is also a recent purchase (Kurtis’ request now that he’s an official whiskey drinker). I loved the added leather detail! The color is perfect to complement our copper mug collection! We’ve had the selves for years, and these entertaining shelves are nearly identical. These lemon napkin rings couldn’t be cuter and look great paired with the blue and white paisley napkins. Summer may just be my favorite season yet for our dining room! 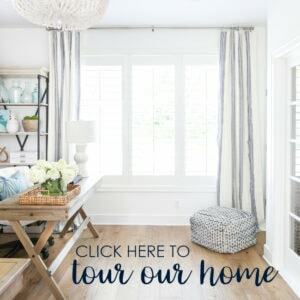 The next stop on the tour is Town and Country Living! Be sure to hop over and check out Jennifer’s tablescape next! You can also see all other stops on the tour below. Beautiful table. Love the lemons. This is absolutely stunning…..not to mention, I think it totally belongs in a magazine. So inspiring! Beautiful! Love the use of lemons with the blue. 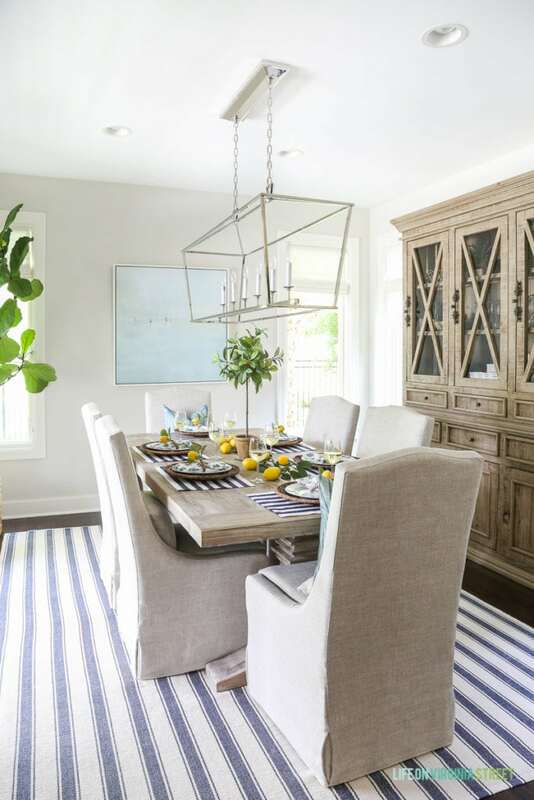 And I love how the rug and placemats are coordinated with blue and white stripes! What a gorgeous table! 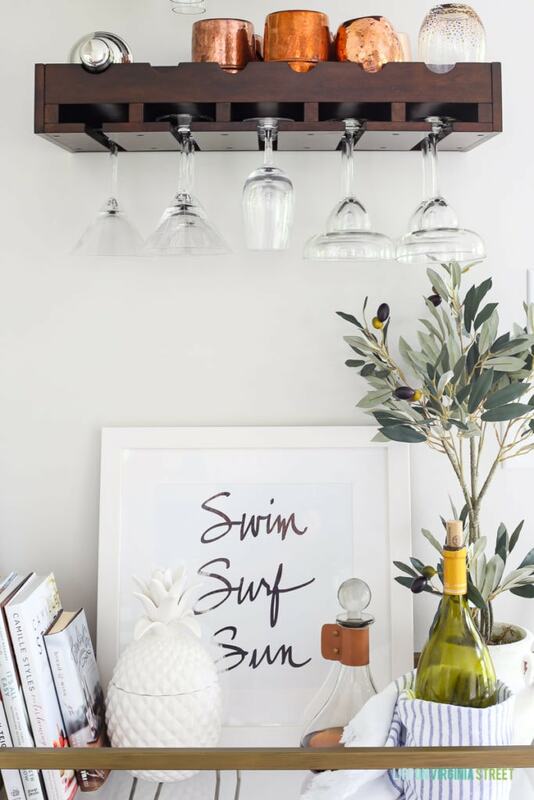 It looks fresh, contemporary and summery. 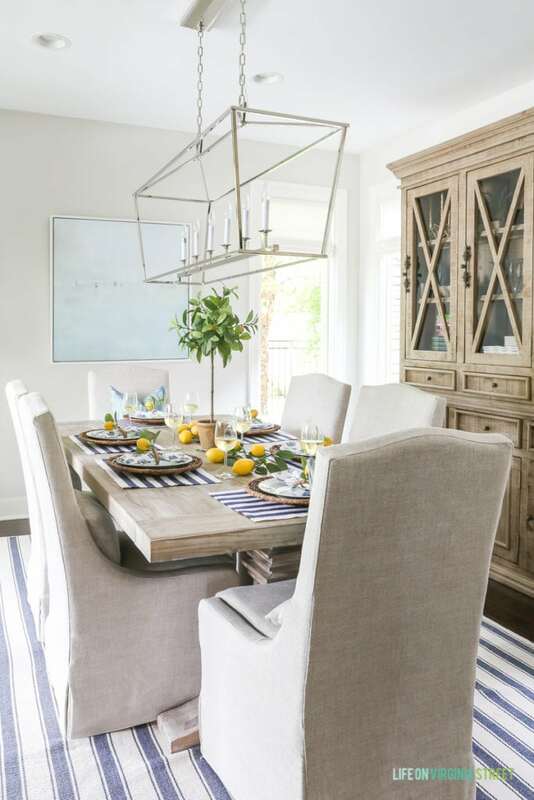 I love the stripes, the blue & white, and then that pop of yellow. Happy Summer! I’m excited to be teaming up with you for the summer Styled + Set Tour! 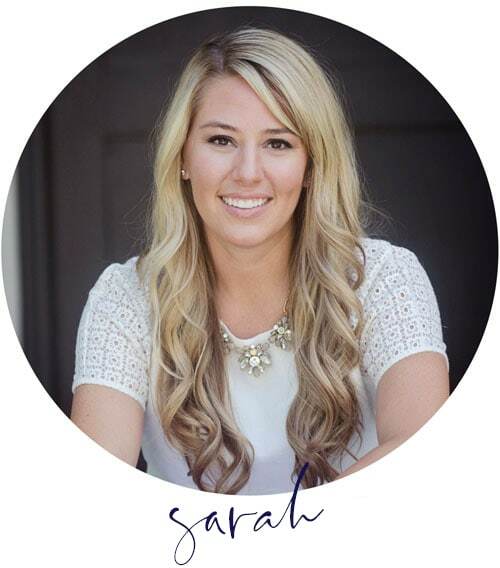 Always love seeing photos of your dining room, Sarah. I love the lemon theme and that decanter is pretty awesome! Sarah, your table is so pretty and wonderfully refreshing!! I, too, have been inspired by the Amalfi coast and the amazing lemons they have there. What a lovely job you did using that inspiration to create this summer table! 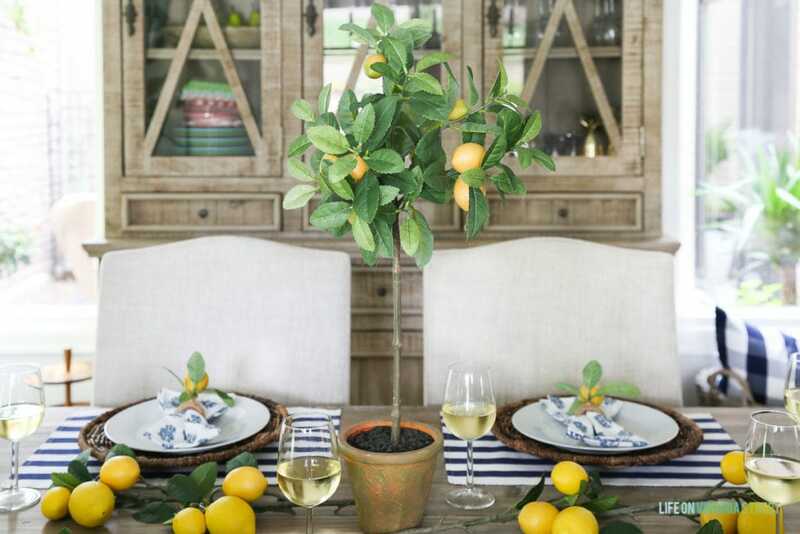 So beautiful- love the lemons and the fresh feeling your table has! I adore your beautiful summer table, Sarah! The lemons are such a pretty bright addition!